Do you know what is best in traveling solo? You are open both to interacting with other people and embracing new experiences like never before. The first part is caused by a pure need – if you don’t interact, you won’t find a way to a hostel in an unknown town, you won’t hear any useful, non-guidebook recommendations of local cafes, you won’t socialize with other interesting people who have their stories to share. The second part means, among other things, being the ultimate king of your plans. Do you feel like changing your destination last minute? Fine. Do you want to stay all day in a hostel or a tent and just recharge your batteries? Ok. Do you want to sightsee like crazy all the attractions of the city? Off you go. Being the queen of my time, I decided to stay at the Lake Shkodra only one night and set off to Koman early morning next day. I got up before 5 am, saw beautiful sunrise and was sitting in a mini-bus to Koman at 5:40. 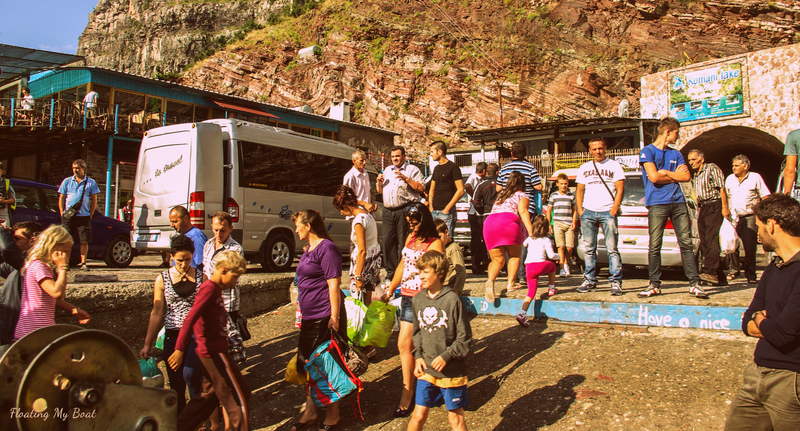 After 8 am, I was already at the small harbour in Koman, watching the hustle and bustle caused by arriving tourists with their suitcases and locals with all sorts of weird looking packages. I bought a ticket for an all-day tour, planning to go through the Lake Koman to Fierze, swim in the Shala River (which washes away the sins :p) and stay the night in Koman, set off to Tirana next day. 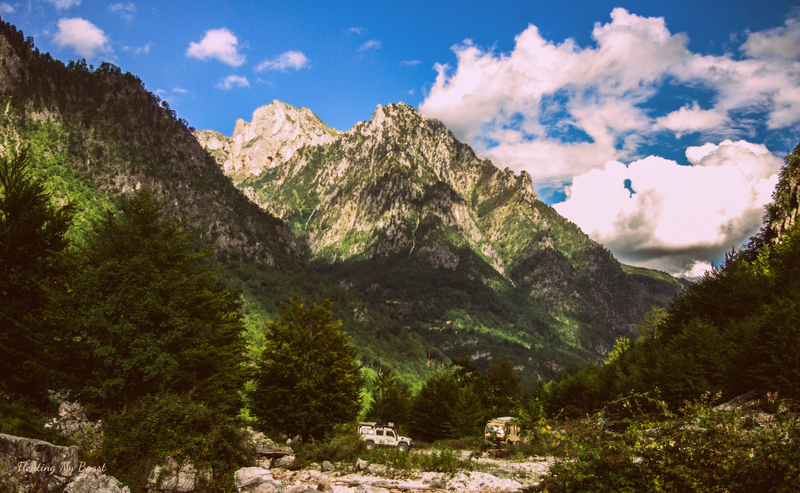 I wanted so much to walk the mountains from Valbona to Thethi, but gave up on the idea since I had no reliable information regarding the safety, signs and I didn’t want to do be alone in the mountains. The drive in the ferry was amazing. First, the lake was surrounded by high and steep green mountains, which with time, changed into white rocks. 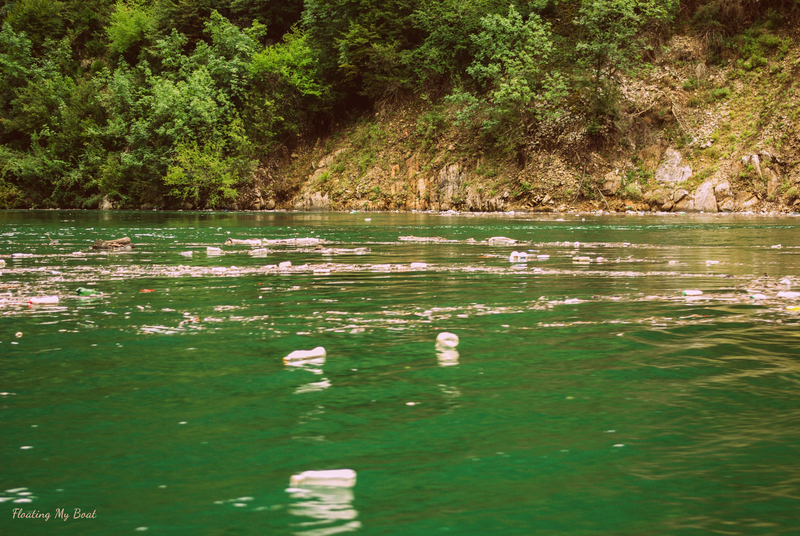 The only annoyance was that after approximately two hours, our boat passed through a thick tail of plastic rubbish: from bottles to flip flops. Albania is doing great developing tourism, but they clearly still have to work on their approach to rubbish disposal. At one point, the weather changed from pleasantly warm and sunny into freezing cold with rain. I didn’t feel like staying any longer on the ferry, so I spontaneously decided to get off in Fierze and go with the mini-bus to Valbona. In the bus, filled mostly with tourists, I heard someone speaking about the Valbona-Thethi trail and I decided to join the conversation. As it turned out, Jarmo from the Netherlands with Margo from Warsaw were planning to walk the Albanian Alps. In the nick of time we agreed to do it together and that’s how significant and beautiful things started happening on my solo trip for the first time. We arrived in Valbona after some 30 minutes. Jarmo had booked a place at Katherine’s guesthouse/hostel in advance, Gocha and me wanted to stay in tents. 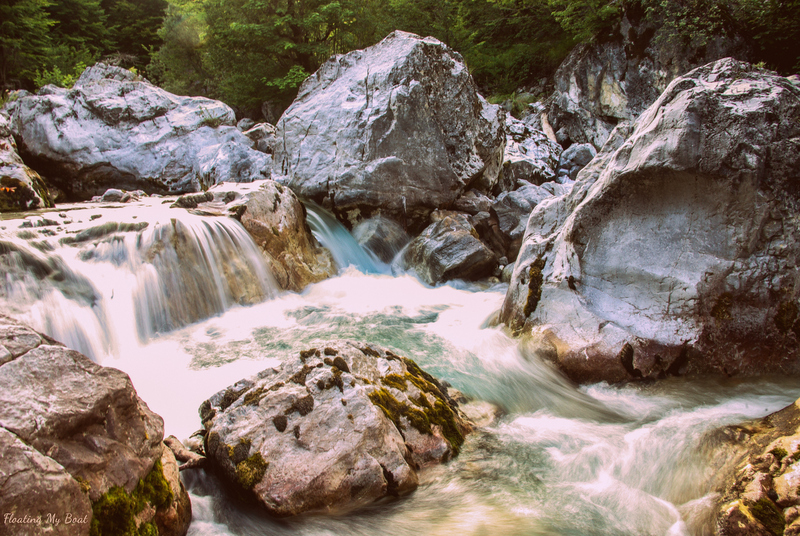 The camping site was not fully developed yet, but I could not imagine a more stunning location: surrounded by mountains, near a pleasantly humming river, under robust trees. We pitched our tents and went for dinner. Shortly, a German couple we met at the bus joined us. As the sun was slowly hiding behind the mountains, it became quite cold outside. To warm ourselves up, we went together to see around the Valbona valley. Jarmo found a trail to some lake and we decided to find it. However, instead of finding the lake, we found a river with many little waterfalls, a small cemetery and a little village. When we decided to go back, we found the lake by a complete incident. The view was definitely not worth all the trouble. What was supposed to look like a lake was more of a garden pond with muddy water. When we reached Katherine’s place again, it was becoming seriously cold. Jarmo was staying indoors so he wasn’t much worried, but Gocha and me were quite concerned about the falling temperature. We asked Katherine if she had some blankets. Luckily, she had many and borrowed us whatever we needed. In the tent, before going to sleep, we watched the starts with Gocha. Honestly, never before have I seen such a pitch-black sky with such bright stars. There were absolutely no cities within 70 km, no light pollution and consequently, every little star could show off its power. Sleeping in the mountains, by a brook, with a great company tent “next door” under such a clear sky was so far one of the best experiences I’ve ever had, not to mention an amazing bond we all naturally developed, especially with Margo. Sometimes, you just meet someone and without any effort, you just hit it off. Topics for discussion come naturally, silence is not awkward, priorities converge. Would it have happened if I was travelling with some friends? 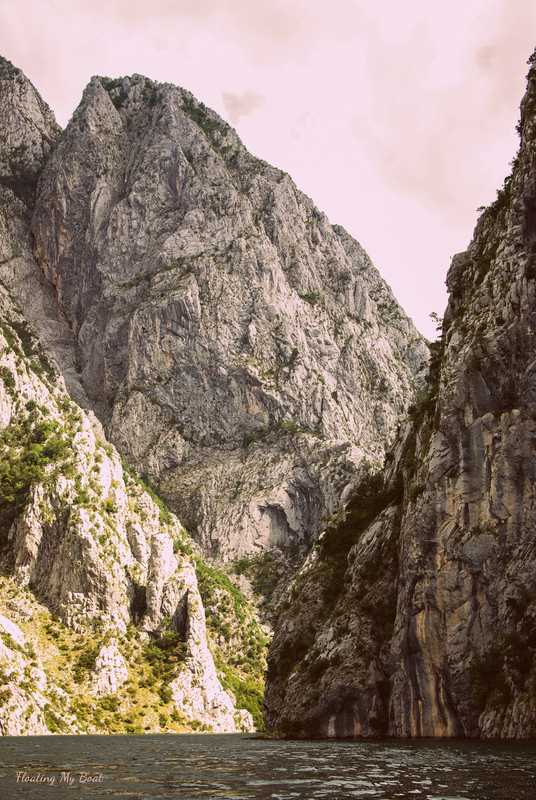 Next post will be about walking the mountains and some obstacles we encountered on the way. Stay tuned!